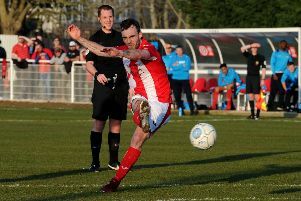 Brackley Town manager Kevin Wilkin was relieved to see his side climb out of the Vanarama National League North relegation zone again following Saturday’s 2-0 victory at Hednesford Town. Both goals came in the first half at the fellow strugglers where Lee Ndlovu and top scorer Steve Diggin, with his 14th of the campaign, earned three vital points ahead of next weekend’s trip to Lowestoft Town. Diggin said: “It was a solid performance, we scored two good goals and we managed the game well. That was a big game for both clubs and a big result for us. “We have been playing well and not getting the results but we dug deep, showed good character and got the win the players deserved.